For years, you’ve heard the key names in marketing talk about big data, testing and conversion optimisation – all in the name of making informed decisions. Then you have the tales of small tests having major impacts on conversion rates, which make it hard to resist testing every detail on your most important pages. While these CRO success stories are great for promoting A/B testing tools, they paint an inaccurate picture of conversion optimisation. Not only that, but they encourage you to go about testing and data collection in the wrong way. Before you know it, you’re suffering from data overload and decision fatigue – a far cry from the “informed decisions” you were originally promised. 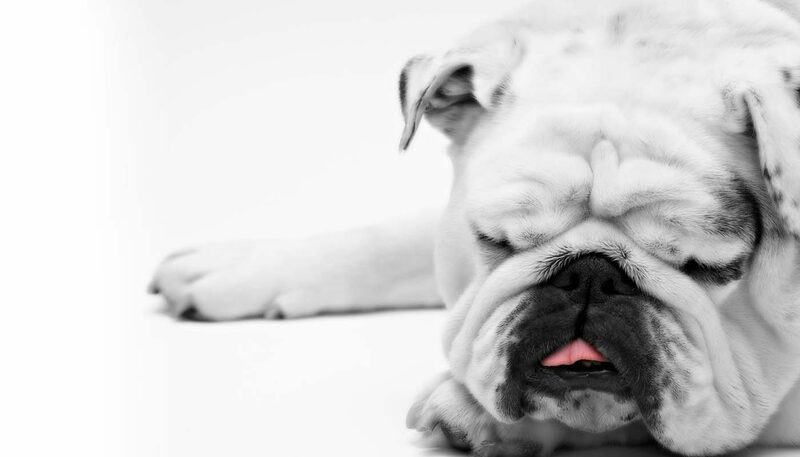 Decision fatigue isn’t only a problem for marketers; it’s bad for business and life in general. You may be familiar with the term (sometimes called choice fatigue) from UX design and conversion optimisation, which says providing users with too many options makes it difficult for them to make decisions and take action. However, decision fatigue in the larger business sense, refers to making bad choices because you force yourself to make too many decisions. Ross Kimbarovsky, crowdSPRING CEO, offers advice on how to avoid decision fatigue in business. The reality is, every decision you make takes a toll on your mental capacity to make future decisions. The thought process the human mind goes through when it makes a decision literally drains it of energy, which leads to rash decision making and mistakes as the day goes on. This is why Barack Obama famously wore the same suit every day; a decision hack shared by Mark Zuckerberg and many other entrepreneurial CEOs. Your brain has a finite capacity to make decisions effectively. The more decisions you have to make throughout the day, the sooner you’re going to start making mistakes. And the more mentally (or emotionally) draining each of your decisions are, the more mind power they zap from you. What has any of this got to do with marketing? The marketing industry is data obsessed right now and it’s developed an unhealthy habit of binge collecting data but then doing very little with it. Despite all this information coming in, when it comes to making informed decisions based on it, the majority of marketers come unstuck. Your first problem is data volume. When you’ve got too much data in front of you (repeat data, irrelevant data, unattributed data, etc. ), you’re wasting time and effort ploughing through everything to find the figures that really matter. Your second problem is data quality. This is determined by the tools you choose, where these tools source their data, the metrics you track and the system you have in place to process data. Once you start collecting the wrong data or processing it ineffectively, you cripple your ability to make decisions. 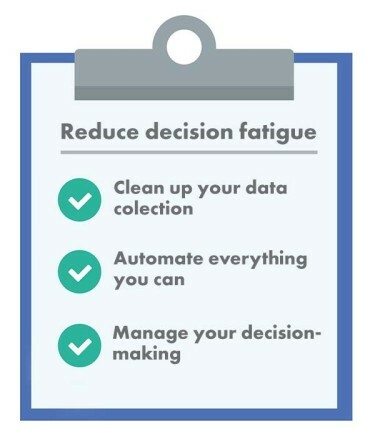 How can I reduce data overload and decision fatigue? Collecting data isn’t your goal; making better marketing decisions is what you’re after. Which means you need to focus on collecting quality data over quantity. This starts with knowing what data benchmarks your goals and how you can use it to measure improved performance. Also, be realistic about the amount of data you can handle. Don’t waste your time with irrelevant, duplicate or contradictory data because all this does is reduce quality and add to your workload. Strip your data collection down to what matters most and focus on these key areas. Automation and machine learning can do wonders for decision fatigue. The technology is already capable of making decisions for us, as long as we provide it with the right data and parameters to run the necessary calculations. Automation and machine learning also make it easier for humans to make decisions by cross referencing key data points, in mass volumes. This empowers us to make complex decisions in ways that were never possible before – and less taxing decisions mean less fatigue. This is the future of mass data handling without the decision fatigue so many marketers are currently experiencing. What a great comment that is. Allow your team to take some of the decision-making burden off your shoulders by strategically delegating the workload. This works both ways, too, of course. Overloading any member of your team with too much responsibility is setting them up for failure. Luckily, you don’t need to go it alone. It’s never been easier to outsource tasks to agencies and reduce the workload on your own team. And, if you want to handle data in mass volumes and remove the burden of decision fatigue, finding an agency that manages the data collection and reporting process takes care of both problems at once. When 69% of UK marketers feel data collection is getting in the way of their core marketing duties, you know there’s a problem. High volumes of low-quality data cripple your ability to make informed decisions and this is a major concern. You don’t want to waste time and resources on collecting useless data – and you certainly don’t want to be making key marketing decisions based on this kind of data. It all starts with collecting the right kind of data and this is what we’ll be looking at next month. In the meantime, if you’re suffering from data overload or decision fatigue, call us on 023 9283 0281 to find out how we can help. Big data is a marketer’s goldmine, able to pinpoint and understand target audiences with an accuracy and level of detail unimaginable less than a decade ago.